The YMCA and Greater Northside Management District are teaming up to support Trash Bash 2019 at Little White Oak Bayou on Saturday, March 30, 2019, from 8 am -12 pm. 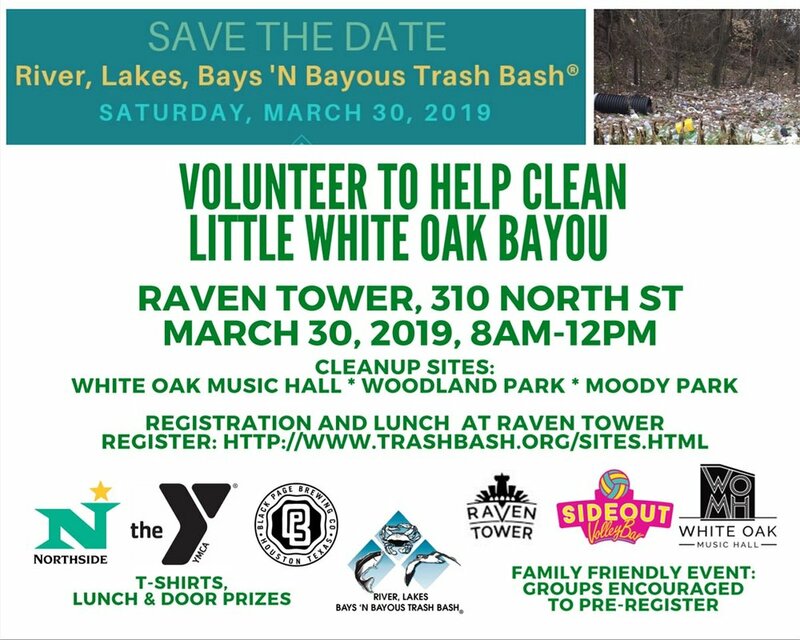 Volunteers should register at Raven Tower, 310 North Street, or online in advance at http://www.trashbash.org/sites.html and select Little White Oak Bayou. Cleanup sites include Woodland Park, Moody Park and White Oak Music Hall. All volunteers are required to sign a liability release form. It is recommended that you wear and/or bring the following items: pants, sunscreen, hats, insect repellent, rubber boots, and raingear. No sandals or flip-flops. All volunteers must register or check in at Raven Tower beginning at 8 AM. Do not go to the cleanup site. You will receive gloves, trash bags, a ticket for lunch, and a ticket for door prizes. At 9 AM volunteers will board shuttles for transport to the cleanup site. Participants will return to Raven Tower at 11 AM for a free lunch, entertainment, door prizes, and fun environmental activities.